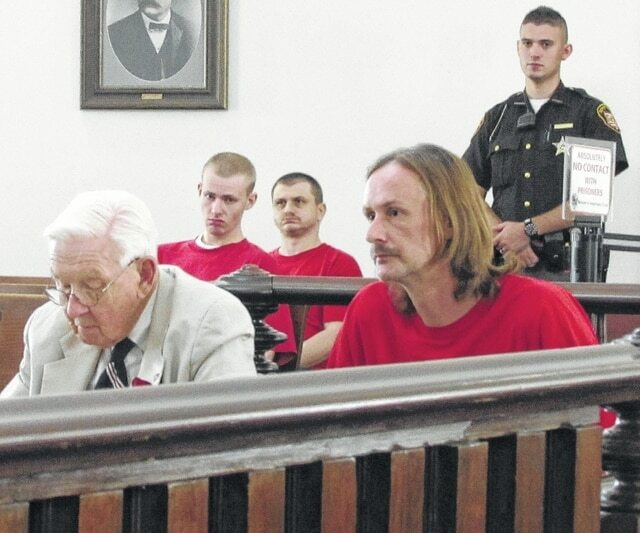 Joshua Knauer is pictured with defense attorney Conrad Curren on Wednesday in Highland County Common Pleas Court. In the center and seated in the background are Trevor Roades, left, and Joshaw Bridges, right. The pair of men responsible for the May armed robbery of a Greenfield area store are each heading to prison for eight years. Trevor C. Roades, 20, pled guilty on Wednesday in Highland County Common Pleas Court to aggravated robbery and Joshua A. Knauer, 37, pled guilty to complicity to aggravated robbery. Both are first-degree felony offenses. As previously reported by The Times-Gazette, the two were arrested following the investigation into the reported May 12 robbery at knife-point of Country Corner Market on SR 28 west of Greenfield. Prosecutor Anneka Collins said Wednesday that while Roades, who is the one that entered the store and brandished the knife, didn’t hurt anyone, the incident was “exceptionally violent and obviously scary” for the two clerks present. The state recommended “no less” than six years in prison. Store owner Wilbur “Web” Young addressed the court and said the robbery was “more violent” than any other he had seen at the store in his 23 years there. He said the surveillance footage showed Roades go behind the counter, go after one of the clerks, and pin her against a freezer. Young said the two female clerks present during the incident are 20 and 23 years old. “He scared those girls,” Young said. He told Roades that it would take the girls a lot longer to get over the trauma he’d caused than it would take for Roades to serve his time in prison. “Personally, I think he should get the whole 11 years, but that’s up to you,” Young told judge Rocky Coss. Wagoner said that Roades’ record consisted of two misdemeanor offenses, and that the defendant didn’t have “half the record” of co-defendant Knauer. Wagoner said he wasn’t trying to excuse Roades’ actions, he was just asking that those things be considered by the court. Coss noted Roades’ minimal record, but he said he had to consider the facts of the case and the effect on the victims. Roades was visibly emotional when Coss sentenced him to the eight-year prison term. With Knauer, Collins again recommended “no less” than six years in prison. She noted Knauer’s prior felonies, five in all. Defense attorney Conrad Curren said Knauer was “very different” from Roades in that Knauer “did not participate in these acts of violence.” Curren said Knauer drove the car, but did not enter the store. Young told Knauer that he was “just as guilty” as Roades. “While you were not in the building,” Coss said to Knauer, “the law says you are guilty when you assist” someone in committing a robbery offense by driving the “getaway” vehicle. The judge said that he would typically consider a lesser sentence for the driver of the vehicle used to flee the scene, except for Knauer’s record. Coss said Knauer’s previous convictions included drug trafficking, theft, and corruption of a minor. He has also served prison time, the judge said. Each of the defendants will be under the supervision of the Adult Parole Authority for five years upon their release from prison.